Internationally renowned sweets brand Sugar Factory American Brasserie is the perfect place for all ages to indulge in sweets, treats and delectable eats. Known for its famous candy accessory, the Couture Pop, Sugar Factory has many celebrity fans including Kendall and Kylie Jenner, Drake, Jennifer Lopez, Kim Kardashian, Flo Rida, Hailee Steinfeld, Katy Perry, Scott Disick, Jason Derulo, Britney Spears, Jerry Seinfeld, Selma Hayek and Mel B. Guests can expect a whimsical candy land experience with floor to ceiling candy bins, fun retail items, homemade gelato and artisan coffee. 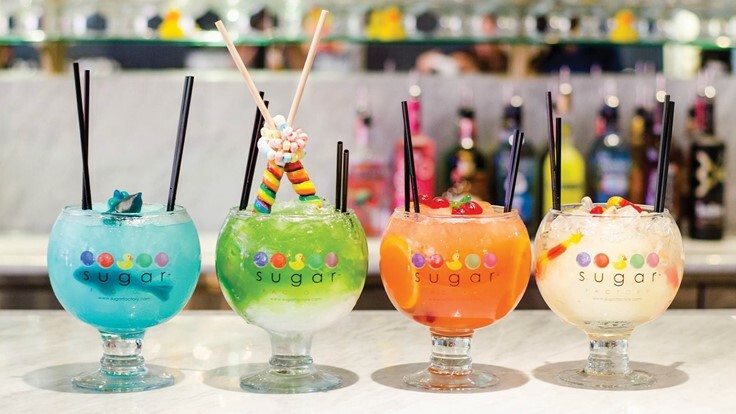 Instagram-worthy menu items range from their famous 24-scoop King Kong Sundae, piled high with various toppings, to their signature alcohol-infused candy smoking goblets such as the Lollipop Passion, garnished with lollipops and candy necklaces.